My favorite cookies, from my favorite restaurant, the chocolate chunk cookies from the Farmer’s Daughter are made with fantastic eating chocolate (not baking chocolate), which leaves the chocolate gooey long after it has cooled. Melt butter and allow to cool. In large mixing bowl, combine sugars. Add melted butter; beat until silky. Add eggs, yolks and vanilla. Scrape bowl and beaters well. Add flour, soda and salt. Beat until no flour is visible. Gently beat in chips. Scoop out using an ice cream scoop, or roll into balls. For thick cookies, freeze. For thin crispy cookies, bake as soon as finished. For 1/2 dozen cookies made with a size 12 scoop (or rolled to the size of a baseball) cook at 350 F for approximately 20-25 minutes. 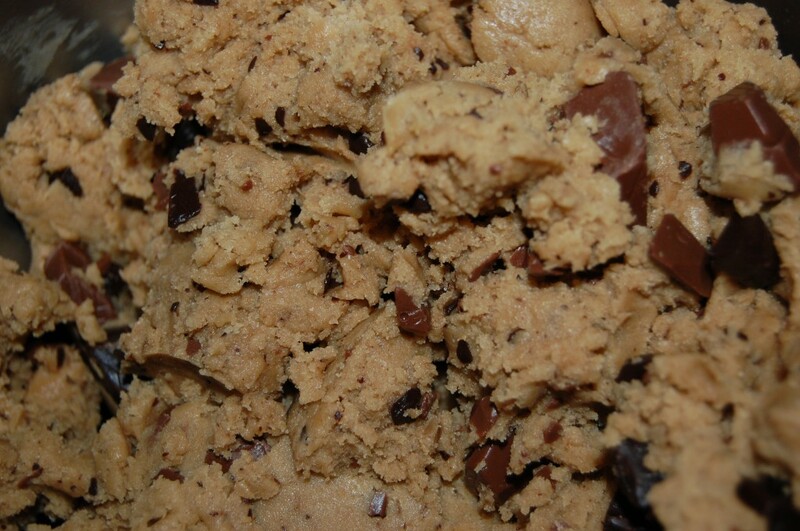 For 6 dozen cookies made with a size 40 scoop (think heaping tablespoon) cook at 350 for 8-10 minutes. *Baking time will vary, depending on whether you freeze them or not.